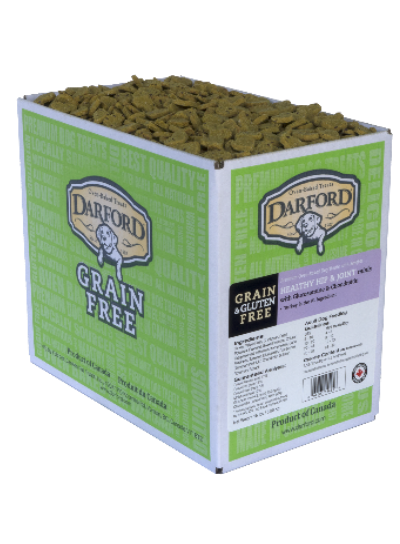 What do you get when you cross a Darford grain free treat with a whole bunch of peanut butter? A peanuty taste of paradise that dogs love. These treats contain a special blend of fruits and vegetables, they’re rich in antioxidants and vitamins, they contain no artificial colors or flavors and they’re gluten free. They’re the mini-sized version of the regular Darford Grain Free Peanut Butter treat – mini perhaps, but still packed full of peanuty flavor. 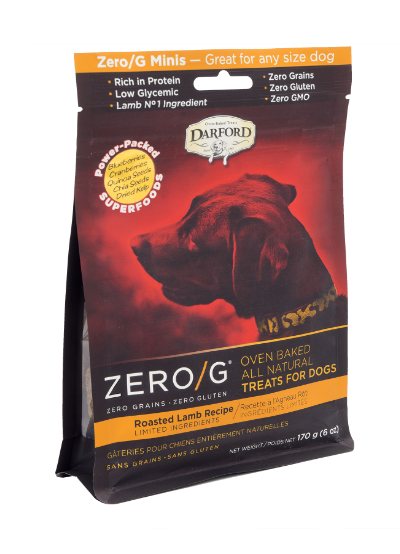 Darford’s delicious and extremely healthy ZERO/G Roasted Lamb treats are now available in Minis! Just like the regular-sized ZERO/G treats, the Minis offer zero grains, zero gluten and they don’t contain any ingredients that were genetically engineered. These limited-ingredient treats are also bursting with superfoods, like chickpeas, blueberries, cranberries and kelp ensuring your best friend gets all the good nutrition he needs. 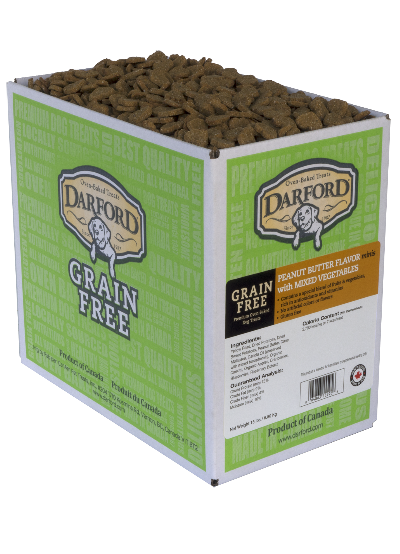 And, they’re the perfect go-to treat for those dogs with food allergies and sensitivities. 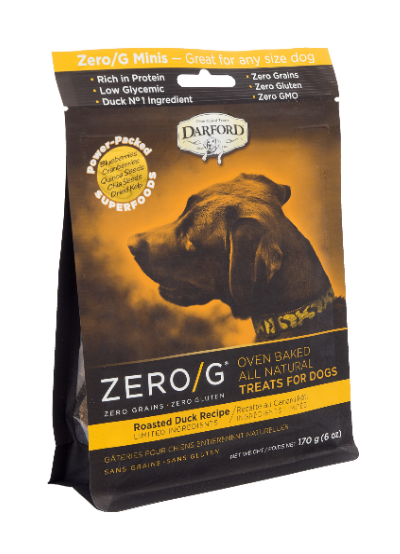 Darford’s delicious and extremely healthy ZERO/G Roasted Duck treats are now available in Minis! 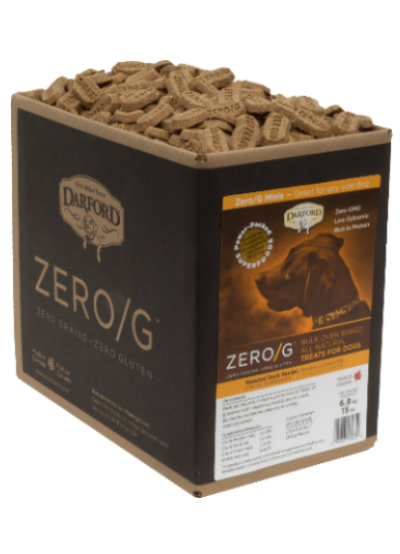 Just like the regular-sized ZERO/G treats, the Minis offer zero grains, zero gluten and and they don’t contain any ingredients that were genetically engineered. These limited-ingredient treats are also bursting with superfoods, like chickpeas, blueberries, cranberries and kelp ensuring your best friend gets all the good nutrition he needs. And, they’re the perfect go-to treat for those dogs with food allergies and sensitivities. 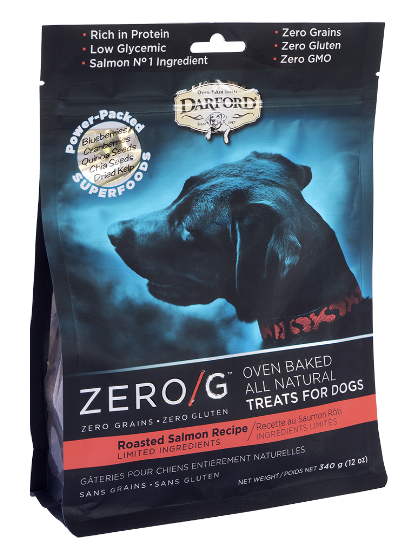 Darford’s delicious and extremely healthy ZERO/G Roasted Salmon treats are now available in Minis! 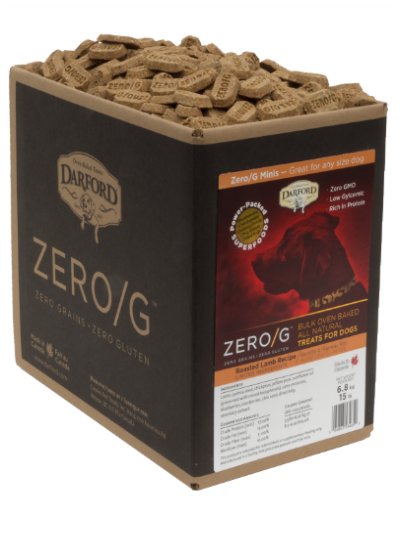 Just like the regular-sized ZERO/G treats, the Minis offer zero grains, zero gluten and and they don’t contain any ingredients that were genetically engineered. 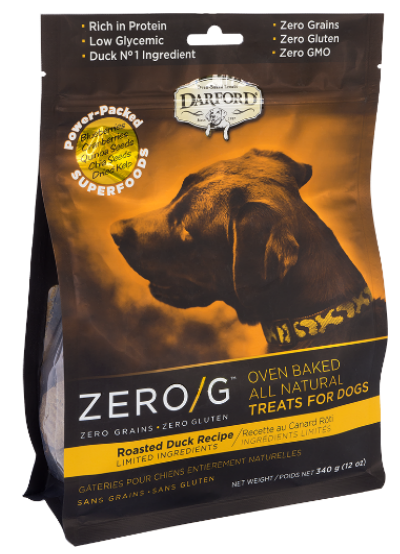 These limited-ingredient treats are also bursting with superfoods, like chickpeas, blueberries, cranberries and kelp ensuring your best friend gets all the good nutrition he needs. 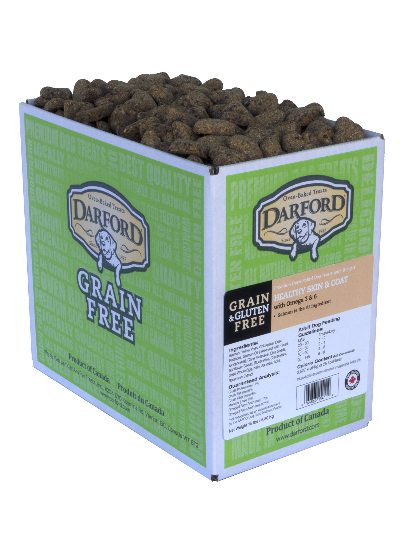 And, they’re the perfect go-to treat for those dogs with food allergies and sensitivities. Darford’s Grain and Gluten Free Functional treats are perfect for those dogs that need an additional health boost. 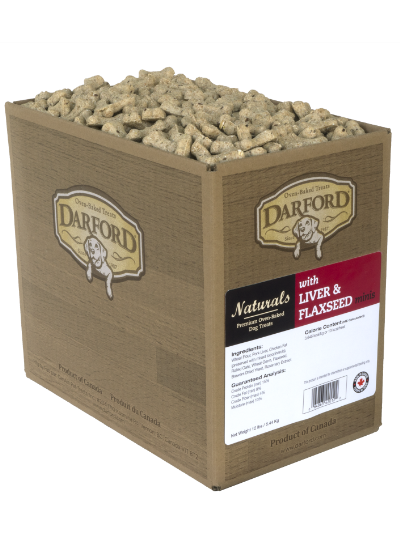 The Healthy Skin & Coat treats have salmon as the number one ingredient, which is a good source of Omega 3 and 6 fatty acids that can help keep your dog’s coat healthy and shiny while supporting his immune system. 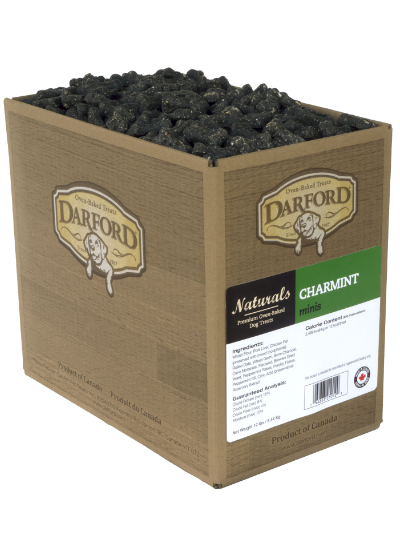 These treats also contain chia sees, sunflower seeds, blueberries and cranberries, so they are packed full of goodness. It’s why we often refer to them as biscuits with benefits! 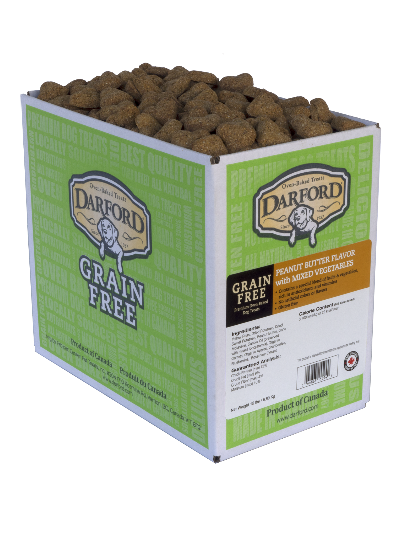 90 to 145-pound dog: 6 to 8 treats per day. 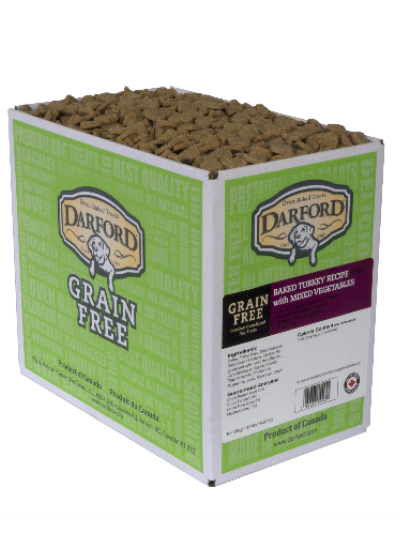 Darford’s Grain and Gluten Free Functional treats are perfect for those dogs that need an additional health boost. 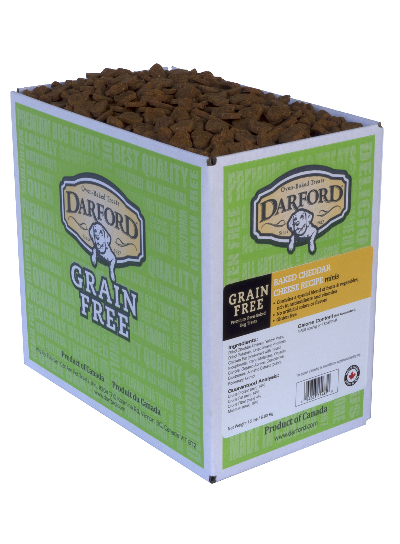 Darford’s Grain Free Healthy Digestion Minis feature added probiotics to support your dogs’ immune health. 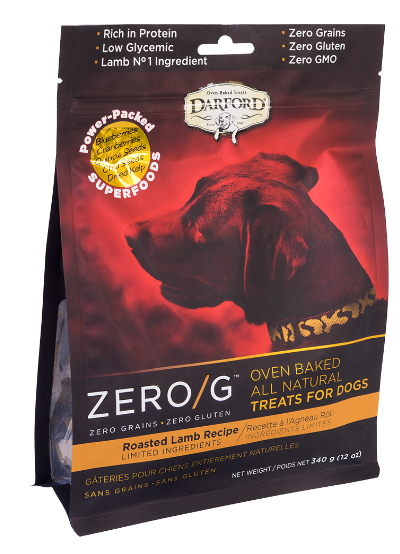 Packed full of healthy, natural ingredients, these tasty minis are sure to be a flavor favorite with your pooch, and they’re oh so good for him, too! 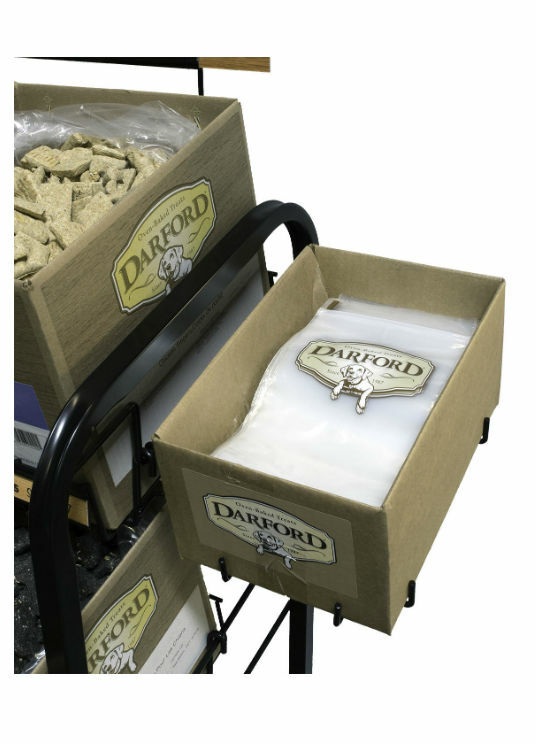 Introducing the perfect addition to the Darford bulk rack – an accessory shelf that holds 500 clear plastic zip-closure bags, with the Darford logo, of course. 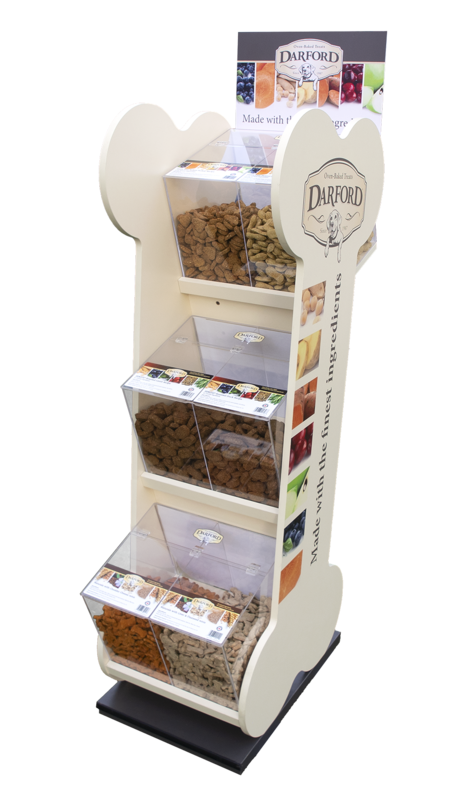 Perfect for customers to mix and match our bulk treats, or fill them yourself and price them so customers can grab and go, without the hassle of using a scale. This is the smaller version of the Mega-Bacon Flavor Bone, hence the name Junior. It may be a smaller size, but it is still big on that delicious bacon taste. 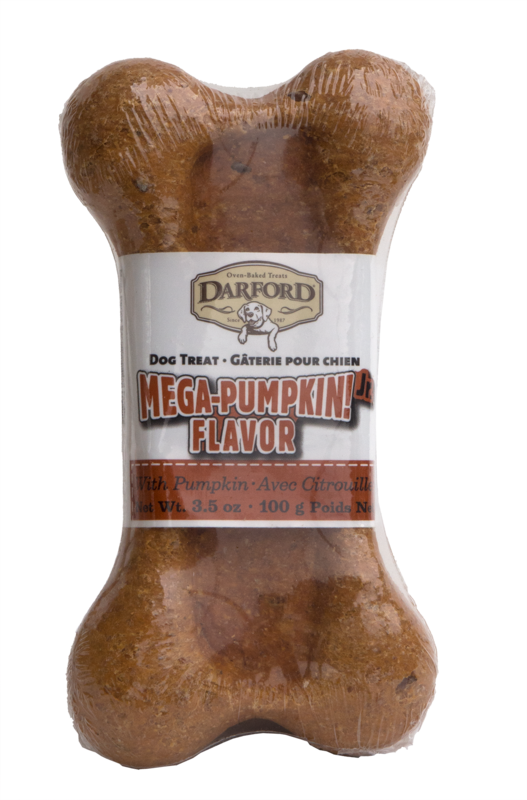 Half the size of the original Mega Bone, this hard-baked Mega Junior still provides great crunch and a long gnawing time but in a more compact size with fewer calories. Better suited for those pooches concerned about their figures. 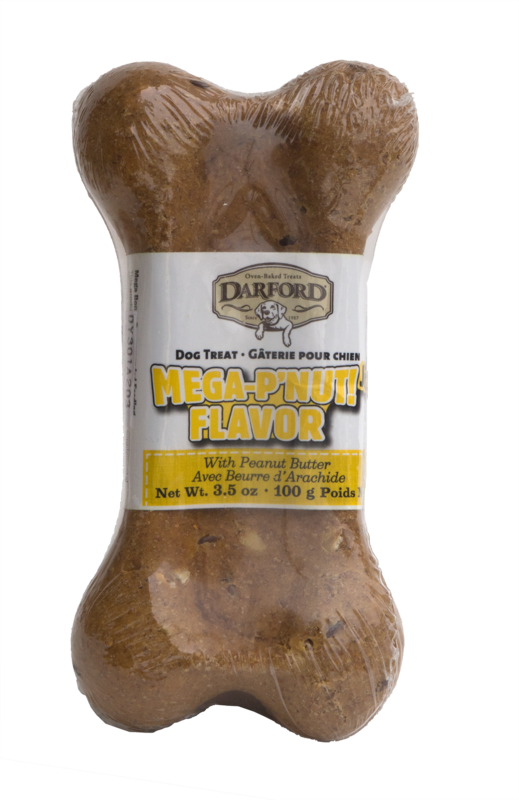 Half the size of the Mega P’Nut Bone, this 3.5-ounce Mega Junior is still big and crunchy, and packs a peanut butter punch. 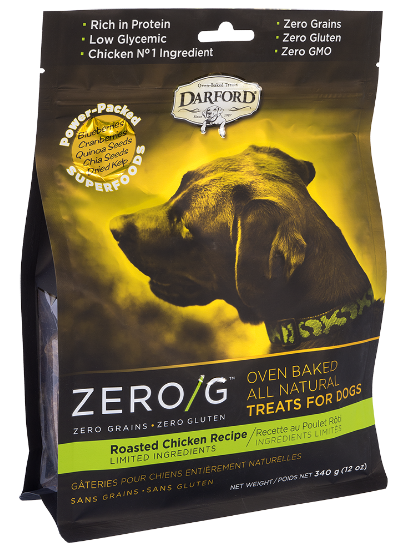 Dogs love these hard-baked treats and being extra crunchy means they’re good for their teeth. 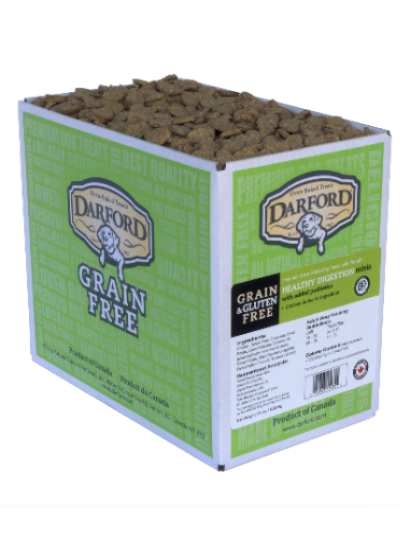 Perfect for the pooch who prefers a more compact size with fewer calories. This Mega Junior smells, and tastes, simply delicious because it’s made with pumpkin and spice and all things nice! Half the size of the original Mega Bone, this hard-baked Mega Junior still provides great crunch and a long gnawing time but in a smaller size with fewer calories. What’s not to love about that?